1. Tell us a little bit about yourself, your current studies and how you came to volunteer for Miro Door? I love to say yes to any opportunity that is going to challenge me or help me take a step closer to my future goals and dreams. 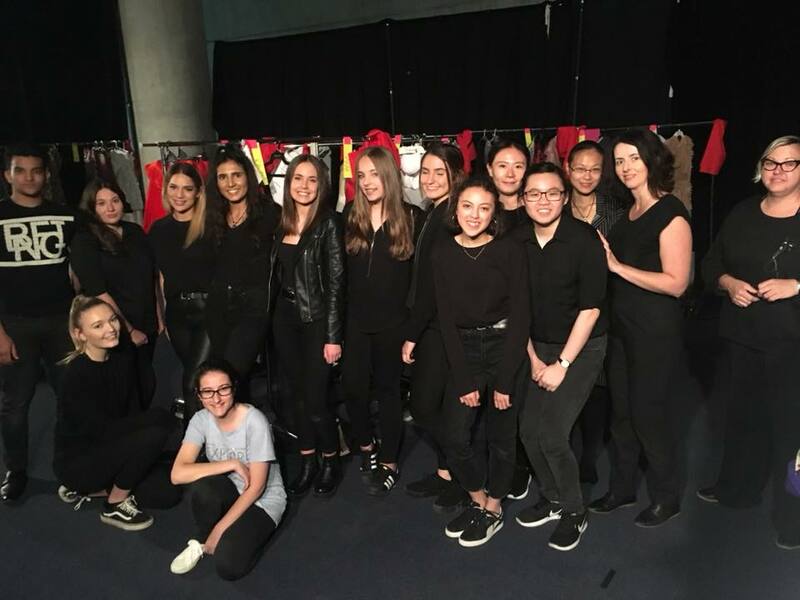 Being a part of the Back of House teams for Miro Door for four shows has enabled me to see what happens behind the scenes of special events and fashion runway shows that seem so effortless and glamorous. I have learnt that there is many roles within an overall backstage team that are responsible for various parts of bringing it all together and without them these shows and events are not possible. I love being a part of the behind the scenes chaos and realised that these teams are literally the backbone to the whole success of a show. Each and every individual contributes to putting all the pieces of a show together and bringing the Stylists or Designers vision to life. I have always wanted to work in events with an strong interest in being a part of Operations/Production team who create outstanding sets and shows. I was introduced to Miro Door by a close friend who is my fashion guru with a lot of experience in Fashion and PR, I knew being a part of Miro Door was a step in the right direction. 2. With the Miro Door opportunities what has been some highlights for you this year? Working behind the scenes at the events that Miro Door are a part of, provides so many opportunities and exposure to a world that I would not normally get to see. No day or event is the same and there are those moments I had that I feel I have to pinch myself out of a star struck (or fan-girl) moment as I have been amongst well known celebrities and also bloggers that I follow religiously on Instagram. I think people underestimate the role of a volunteer and assume volunteers are allocated with boring insignificant jobs yet its not like that at all. Some of my highlights would include my experience with being a part of a Front of House (FOH) team in fact I was in a FOH role at Mercedes Benz Fashion Week this year. This gave me a chance to see the runway show of high end fashion labels well out of my price range (however admired from afar and on the wish list nonetheless). It’s always inspiring to get to work alongside some of Australia's elite stylists and models and being a part of team that executes a well-produced show where you share the nerves and the adrenaline. One of my highlights of this experience was at tonight’s Laureate Awards show. The model I was assigned too was late for the rehearsal. So I was asked to fill in for her, I never realised how short I was until I had to walk between models who seemed like they had legs up to their head. In trying to keep my face straight, walk down the runway which felt almost like a jog trying not to trip or be the one who walks the wrong way. Nevertheless it was a funny moment that I will always remember and my own one minute to fame. 3. What was your experience like at the Adelaide Fashion Festival as well as the Laureate Awards? I would like my future job roles to include travel. So it was an easy decision when the opportunity came up to be a part of the Adelaide Fashion Festival. I had already worked with the Stylists for the Sydney Myer show and so I felt at ease when I flew down to Adelaide to be a part of the BOH team. I worked alongside Jen Hawkins and I embraced the challenge of seeing how fast I could do a quick changeover, the versatility in dressing for the different brands was broad, one day I was dressing a model in 'We are Kindred' florals and the next day I was trying to figure out (with success) how to put a tie on with a Pierre Cardin suit. The overall vibe and atmosphere for the Adelaide Fashion Festival was very fun and full of excitement. It was hard to sit still and not dance along with music whilst waiting for our models to return. For tonight’s Laureate Awards the show included winners of the past Laureate Awards so it was mesmerising to see how drastically fashion has changed over the years. 4. How have you found the Miro Door team including our Manager, Katie Rhodes and the other team members you have met? I don't know how Katie does it all, but nothing is possible without her! She organises so many volunteers for many shows who come from all over the country. Bringing it all together is vital for the smooth running of these shows. She is definitely the boss lady and very inspiring how she makes it look easy. Everyone I have met through Miro Door has been great and there’s always something to learn from them all. Every show I have been too I have learned something new and made friends so easily as everyone is always approachable and like-minded. Its eye opening listening to everyone’s different reasons for being there and what they aspire to do in the future and how they want to use their volunteer experience in the future. 5. Do you feel your experience as a volunteer for Miro Door was beneficial and a good path to take considering your personal goals and aspirations? 100% yes. Being a volunteer for Miro Door you get an opportunity to challenge yourself and work out exactly it is that your passionate about or makes you tick. Through my experiences with Miro Door I have discovered more about myself. The boss chick you see walking around with an earpiece and a clipboard doing a million things at once with everyone is depending on her and knowing she has it all under control, that’s who I aspire to be. 6. Any tips for first time Volunteers for Miro Door? Say yes to everything. Best way to learn is to throw yourself into the deep end and challenge yourself. Do not shy away from any opportunity as without doubt you won’t regret any moment. People may think the fashion world is intimidating however individuality stands out the most. Although you don’t know what to expect, keep in mind that you are a playing a part in an overall production and the show’s success is also thanks to you.